Tropical Cyclone Ashobaa continues toward a landfall in eastern Oman and NASA's Terra satellite captured an image of the storm on its approach on June 11. NASA's Terra satellite passed over Ashobaa on June, 11 at 06:35 UTC (2:35 a.m. EDT). The Moderate Resolution Imaging Spectroradiometer or MODIS instrument aboard captured a visible image revealing a powerful, thick band of thunderstorms spiraling into the center from the southwestern quadrants of the storm. The western quadrant was over the east coast of Oman, bringing heavy rain, tropical-storm-force winds and very rough surf. At 1500 UTC (11 a.m. EDT) on June 11, the Joint Typhoon Warning Center (JTWC) noted that Ashobaa's maximum sustained winds were near 40 knots (46 mph/74 kph). JTWC forecasters expect Ashobaa to continue weakening as it moves inland over eastern Oman in the next day or two. Ashobaa was centered near 20.8 North latitude and 59.8 East longitude, about 72 nautical miles (82.8 miles/133.3 km) east-northeast of Masirah Island. Ashobaa is moving to the west at 6 knots (6.9 mph/11.1 kph). The JTWC forecast track calls for the center of Ashobaa to pass just north of Masirah Island. 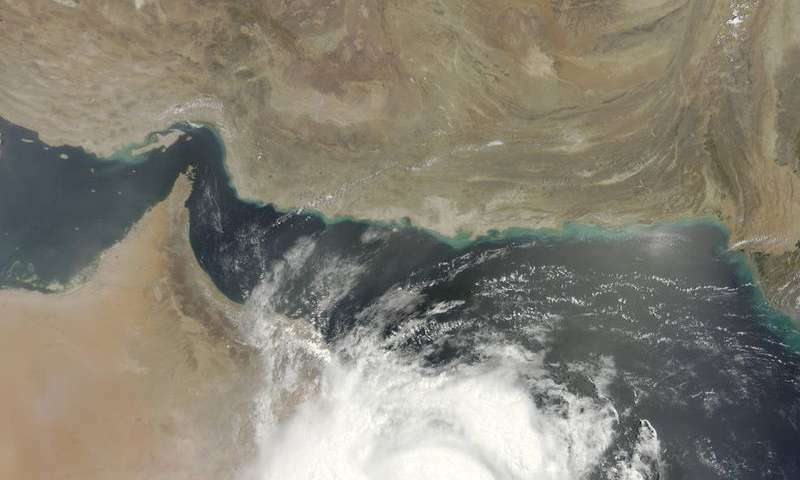 The Oman Meteorology department expects Ashobaa to make landfall between Ras Al Hadd to Masirah Island. As Ashobaa moves toward landfall and then moves inland, tropical-storm force winds and heavy rainfall can also be expected in southern Al Sharqiya, northern Al Sharqiya, Southern Al Batinah , Muskat, Al Wusta, and Al Dhakilia. The JWTC expects Ashobaa to decay quickly after landfall between the interaction with land and dry air moving into the system. The JTWC forecast calls for Ashobaa to weaken to a depression early on June 13.